Is it a posh dinner? Are you staying the night? If you've got a rucksack I'd at least shove in some clean trackie bottoms and a hoodie to wear and maybe a change of socks, rather than sit there in smelly base layers. I'd bring deodorant too. How are you getting back, taxi? I would think so, I mean it’s skiing so I doubt anyone’s expecting you to dress up, it’s just for your own comfort. Why don’t you just ask them? They might not mind you wearing ski gear as you’ll be skiing back afterwards and it’s only lunch. Does one traipse in, fresh off the slopes (as per a mountain restaurant) in one’s socks and gear,. Yes. If your hosts expect anything different when you're on a skiing holiday, they're idiots. Etiquette dictates that one doesn't mess around with people's ski holidays by inviting them to lunch in one's apartment. Who does this? I'm horrified. Well if it’s near the slopes, it no more loss of ski time than going for lunch on the mountain, but I’d certainly just be sitting in my ski gear. Presumably the hosts are skiing too? I would just make sure by calling them and saying something like "we're going to ski there, hope it's ok", unless that's already abundantly clear from the "sense dictates". If you have some comfy slippers, you might consider packing them. Otherwise I wouldn't care about it too much. Depends a bit on who's inviting you. Consider that in Northern Europe, it's quite the done thing to just wear socks indoors. Just make sure you brush off all the snow from your clothes before entering. From what I have seen, on the telly anyway , people who dress up for lunch in a ski resort generally have servants to sort their clothes and helis to save time getting there. If you have neither then "traipse in, fresh off the slopes (as per a mountain restaurant) in one’s socks and gear" has to be the correct answer. And you need to tell them it wants to be ready and on the table when you get there, no faffing, wasting ski time. If they are true skiing friends they will totally understand. Dress up? For lunch? On a mountain? Whilst out skiing? You've gotta be kidding me. If they know you are skiing they won’t expect a change of clothes. Snow brushed off and socks would be absolutely fine I’m sure. For peace of mind I think it’s a perfectly valid question to ask in advance. I can’t see the point of taking clothes “just in case”. All I would do instead of taking snow into the apartment is to have a thin pair of slippers (like in a hotel) and pop them on. Easy to stuff in a jacket/backpack. Dress up? For lunch? On a mountain? Whilst out skiing? This. I'm sure they expect you to be skiing and to be walking about in your socks. I'm assuming this is all in code and metaphor and is all a cover for some filthy, chalet-keys-in-a-bowl, 'afternoon delight' assignation. Just wear your gimp suit under your fartbag, and keep your leather mask unzipped and pass it off as a 'technical balaclava' until you get there. Does pampas grass grow outside chalets in the alps? A friend skied with a Swiss guy who went out as a matter of course with a one-piece skisuit over a suit and tie. definitely black tie and evening wear, and silk PJ's and bunny slippers if staying the night. Seriously, if they know you are out there skiing and they have invited you over, I would go in my skiing gear, and just relax and enjoy their company (and their food) maybe bring a bottle of red wine with me, or a present from my home country. Got to have a get out clause. I mean, what if it's a powder day? I didn't read it properly and thought it was in the evening! I agree with ski gear and nothing else, not even slippers!! Otherwise what kind of friends are they? 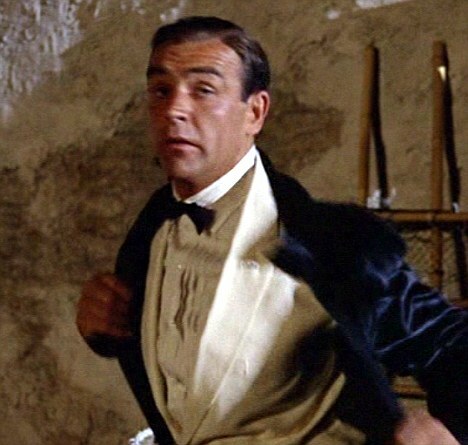 James Bond would manage to ski off several mountains and have a fight to the death, drop his stylish ski suit to reveal an imaculate (and sweat free) dinner suit underneath. I mean, whats the problem? Just take some anti perspiramt / deodorant spray and fresh lippy (if male, it's sunscreen, honest). If the hosts are French, don`t take wine, is is (or certainly used to be) considered rude. A small pressie from the home country is considered polite (again or used to be). Yes take chutney, that's fermented booze they'll never twig. If they are French hosts, take a selection of cheese. Some Monterey Jack, some Edam and mild red Cheddar would surely be appreciated, and would be robust enough to survive in your ski jacket pocket in the morning. If it gets too cold though, remember to put it inside your underpants for ten minutes before you arrive. Spin Doctor, no one should invite you to their chalet when on a ski holiday, unless their chalet is ski-in-ski-out, and you can keep you boots on. Do these so-called friends of yours ski? I would politely suggest that you would rather meet in a restaurant. @spindoctor. Maybe They can lend you a roof box for all the kit you might need to take over for lunch if you try to meet all the advice here as yours is err.... broken. Maybe just bring good company and some annecdotes? After all that’s why they invited you, probably. Hope you have a great lunch! @Spin Doctor, And don't forget to take the cheese out of your underpants BEFORE you knock on the door.